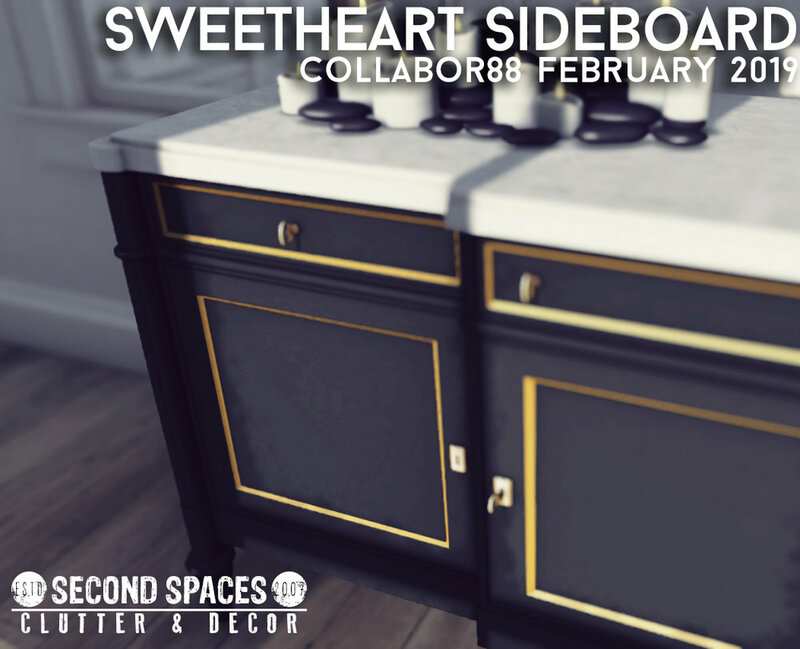 Out now for the February round of Collabor88: the Sweetheart Sideboard! Available in 5 colors, exclusively at C88 through March 6. Out now for the October round of Collabor88! Out now for the August (birthday!) round of Collabor88! 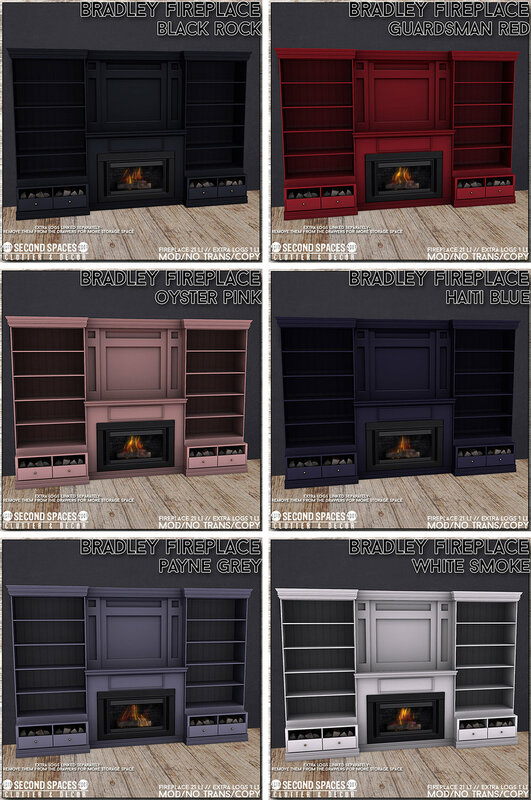 Seven color sets, each including the credenza, plant, and mirror. It's the 8th. IT IS ON. New stuff out now at Collabor88! This round is the C88 Prom round, and my lovely prom date is Isla Gealach of Cheeky Pea. ♥ We've collaborated to bring you a cozy Story Time set - an adorable little nook for curling up and enjoying your favorite book. It's available in a dark version or light, with all the pieces in a set or just the individual pieces that you want - so many possibilities! For this month's theme of 'Timeless Romance', Second Spaces has contributed a Mood Lighting pack, with all the romantic candle sets you need to...you know. YOU KNOW. Check the Deco(c)rate site for all the info you need to subscribe! It's never too late! Summerfest '16 is open! So many amazing beachy things from some of the best designers across the grid - be sure to get over there and bask in the sun! Second Spaces brings the Nautical Highboy, in natural or white, and perfect for all your beachy spaces. Exclusively available at Summerfest for the duration of the event! Happy 2016! Kicking off the new year with a new set out now for Collabor88 - the Holo Set. There are two groups to the set: the set of Holo Chairs, in 4 colors...and the set of Holo Tables, in 4 colors, and including the wall prints and the candles. Hello, December! The new round of Collabor88 is open, and Second Spaces is settling in for a cozy winter. The Nordic Winter Lounge set is available exclusively at C88 for now; it's available in a dark version and a light version, and the full sets include all the accessories. If you just want the accessories by themselves, that's cool - I DID THAT FOR YOU. The November round of Collabor88 is open! From Second Spaces, I have the Autumn Blues Foyer -- it's a whole set, including all accessories, and available in either warm or cool colors. Great for cozying up your entry, hall, or any little space that needs some stuff. ALL THE STUFF. October's Collabor88 is open! This month's theme is 'Burtonesque', and I've got some wacky and whimsical pieces. The Burton Dresser is available in 2 color packs, dark and light, with 3 variations in each set. The Burton Table is also available in dark and light packs, with 2 variations in each pack. AND for the duration of C88, each pack is only 88L! WACKY. The September round of Collabor88 is open! This month's theme is Muted Coven; I've brought the Coven Hall Stand, perfect as a catch-all just inside your door. Even witches like organization. There are four color sets, and each set includes a decorated version and an empty version, for times when you feel less witchy or more witchy. Just 88L per color set for the duration of this C88 round! The July round of Collabor88 is open! This month's theme is 'Under the Sea', and I've brought you some lovely pieces to transform your home into an underwater paradise...furniture-ly speaking. The Second Spaces set has 4 aquatic versions of the bureau, a delicately handcrafted glass sculpture of sea bubbles, and a saucy mermaid with a deliciously tiled tail. For the duration of this month's C88 event, each piece is available for only 88L! Holy Triton! The June round of Collabor88 is open! This month's theme is Summer Punch, with an accompanying palette full of delicious summer colors. For Second Spaces, I brought those colors into your cozy office nooks with the Luster Office set. The sets are available in 4 colors, and you can get a full color set (with all accessories!) for just 188L at Collabor88. If you want to mix & match, then you can also buy the desk, wall organizer, and stools separately for all the color combinations! Each individual item (with the accessories as shown!) is just 88L per color for the event -- wall organizers are 2 LI, desks and stools are 1 LI each. Perfect! Okay, the post title is a bit dramatic, but it explains why I haven't posted about all these new releases until now. I traveled to TX this past weekend, and totally got stranded in Dallas overnight. It was a big ol' mess. I'm home now, and finally got all of my luggage, so I am once again a whole person. A whole person who released a whole bunch of stuff this weekend! The Arcade is open once again!! Still my favorite event, as both a designer AND a shopper. ♥ For this round, my SL is mirroring my RL, as I have become a total makeup junkie in RL these days. The Makeup Junkie gacha set includes 8 little mini-sets: 7 commons and 1 rare. Everything you need to clutter up your dressing table LIKE A BOSS. Just 75L per play, and available exclusively at The Arcade through June 30! I'm also super excited to be a guest designer at this month's round of FaMESHed! I've got the Mercury Storage set, available in dark or light, and each set includes a completely accessorized version as well as an empty version for your own stuff. Exactly perfect for your dining rooms and kitchens! Second Spaces is also part of the Multicultural Menu event - a whole event dedicated to food and cuisine from around the world! I was assigned to the South Pacific region, so I bring you a classic Australian dessert - Lamingtons! Home Show 2015 is now open! It runs from May 1 - 31 and is full of wonderful, amazing home/garden designers from across the grid. It's decorator heaven! 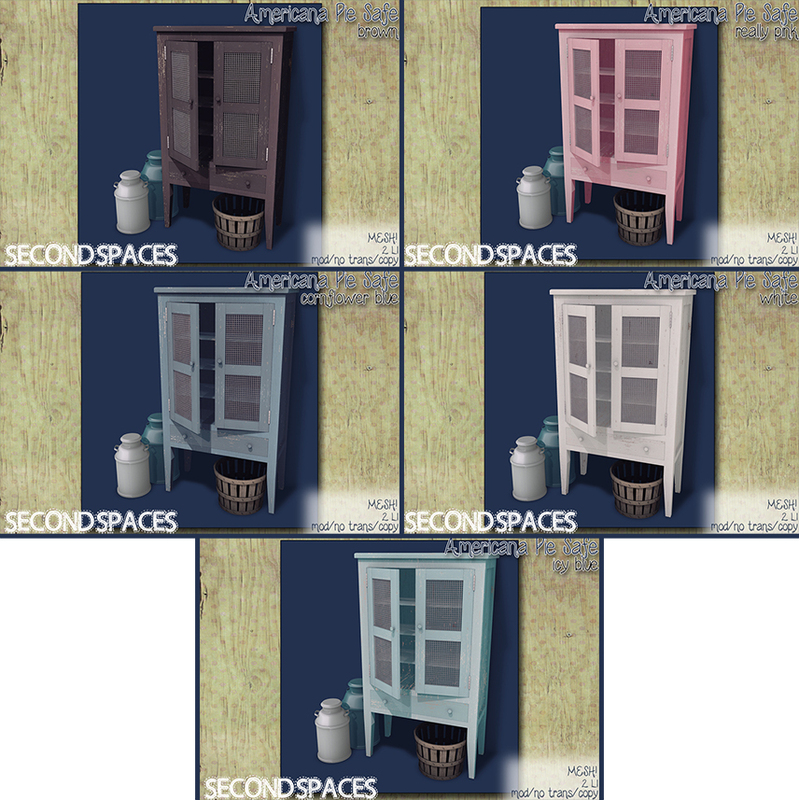 Second Spaces has two new items for Home Show, exclusive to the event for its duration. Introducing the Rhodes Windowseat, great for any room and any window, and perfect for giving you that built-in look! There's also the Step Shelves, a repurposed industrial piece for a little extra storage wherever you need it! The new round of Collabor88 is open! This month's theme is Pretty In Punk; I've got some subtly rebellious and charmingly elegant skull chairs, along with classic armoires that come with the option of sticking it to The Man. Each chair color and each armoire color set are just 88L for the duration of C88 - how punk rock is that? Second Spaces is happy to be part of the new round of Seraphim Social! 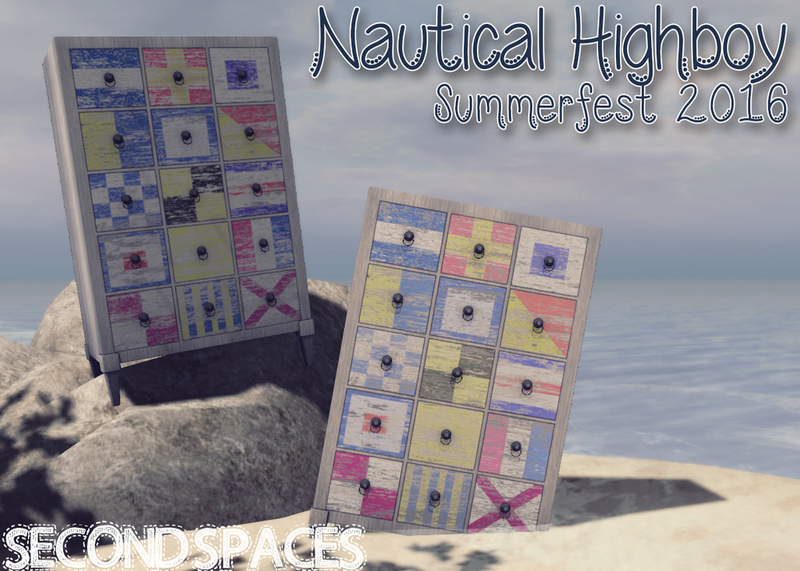 It opens today (Feb 19) at noon SLT. Be sure to stop by Seraphim Social before March 5! The House Hunt has started! Head over to the website to find a list of all the participating stores, preview pics of their items, and clues to help you on your hunt! From Second Spaces, I have the Pratt Table set. It includes a lovingly weathered table, a vintage tabletop weathervane, and a set of ceramic vases on top of books so that you look well-read. This set really has everything. The House Hunt is a paid hunt - each item is only 20L though, so you're in for a lot of great bargains! You're looking for a cardboard box with a heart in it (shown below), and the clue to find my item is: No man is an island.